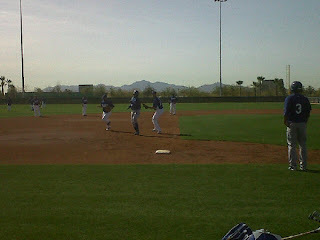 Here is the Day 17 Spring Training Report from the Dodgers. SEEING RED: The Dodgers and Reds will meet for the second and final time of the spring this afternoon at Camelback Ranch. Los Angeles lost 3-1 to Cincinnati in Goodyear two nights ago. Last season, the Reds went 5-4 against the Dodgers and the two squads will meet for the first time in the 2011 regular season on June 3 at Cincinnati’s Great American Ball Park. The Reds will invade Dodger Stadium a week later from June 13-15. TAKING THE MOUND: Dodger left-hander Clayton Kershaw will make his second start of the spring this afternoon after tossing 3.0 innings against the White Sox on Feb. 28. In that outing, the 22-year old gave up just one unearned run and two hits while striking out three. Kershaw is set to turn 23 in less than two weeks and entering his first career Opening Day start, he will have more strikeouts (497) and more wins (26) than any other player in baseball aged 23 and younger in the National League. The only player aged 23 or younger with more wins than Kershaw is Oakland’s 23-year-old Trevor Cahill, who has won 28 games over the last two seasons. Cahill is 18 days older than Kershaw. After Kershaw exits, RHP Lance Cormier, RHP Jon Huber, RHP Roman Colon, RHP Oscar Villarreal and LHP Wilkin De La Rosa will take the mound for Los Angeles. The Reds will counter with RHP Bronson Arroyo. SNAP THE STREAK: The Dodgers lost their fourth consecutive spring contest last night, falling to the Giants, 5-3, in front of a crowd of 11,261 on Fireworks Night. RHP Jon Garland made his 2011 debut and looked sharp, allowing just one unearned run and one hit over 3.0 innings. At the plate, Trayvon Robinson and Juan Castro each collected an RBI, but the Dodgers managed just seven singles in the contest. Through eight games, Dodger starters have posted a 0.93 ERA (2 ER/19.1 IP). GET ON THE BUS GUS: The Dodgers announced yesterday that the Metro will again offer the Dodger Stadium Express bus service from Union Station in downtown Los Angeles to Dodger Stadium beginning on March 28 with the Dodgers’ exhibition game against the Angels. The service will then run throughout the 2011 regular season under a grant approved by the Mobile Source Air Pollution Reduction Review Committee (MSRC). A BIG THANK YOU: The Dodgers would like to acknowledge the fans and clients taking part in this year’s Spring Training trip. The group of nearly 70 people had a welcome dinner Thursday night where they met Andre Ethier, Chad Billingsley, Clayton Kershaw and Hall of Famer Tommy Lasorda. Prior to taking in the game vs. the Giants last night, the group received bunting instruction from Dodger legend Maury Wills and today will meet with Dodger Manager Don Mattingly and Dodger GM Ned Colletti before flying back to Los Angeles. In addition to several season ticket holders, the clients represented include KCAL, FSN PRIME TICKET, Hyundai, Kaiser Permanente, Farmer John, Time Warner and John Hancock. BIG MAC: The Dodgers would like to wish a very happy birthday to right-handed pitcher Mike MacDougal, who turns 34 today. MacDougal shares his big day with former Dodgers Kevin Brown, Paul Konerko and Chad Fonville. A little known fact is that MacDougal’s given name is actually Robert Meiklejohn. Meiklejohn is his mother’s maiden name. Now you know. 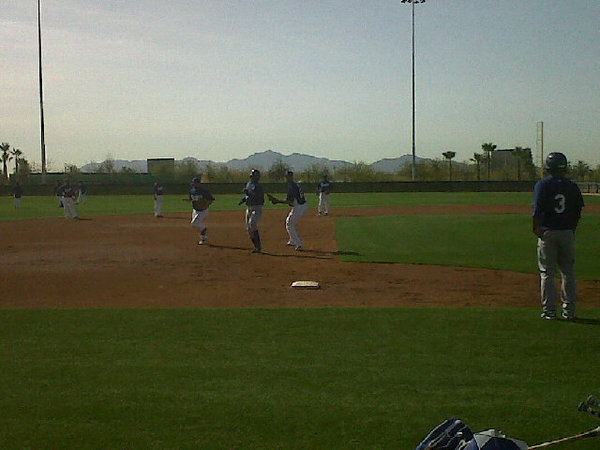 ON THE INJURY FRONT: Dodger first baseman James Loney will miss today’s game with some stiffness in his left knee. Loney took an MRI this morning in Phoenix and the results are pending. The Houston, TX native is set to begin his sixth Major League campaign and over the last three seasons, his 480 games played are tied with Robinson Cano for third in the Major Leagues. Loney trails only Prince Fielder (482) and Adrian Gonzalez (482) over that time. TOGETHER IN TUCSON: It was announced yesterday that the Dodgers and Diamondbacks will play a Spring Training game on Friday, March 25 at 1:05 p.m. in Tucson with proceeds benefitting the Tucson Together Fund. The fund provides financial assistance to the victims, witnesses and their families for expenses associated with the January 8th tragedy. The contest will be played at Kino Veterans Memorial Stadium (formerly known as TEP) with tickets available at Dodgers.com/Spring. BIENVENIDOS: The Dodgers welcomed a contingent of Mexican media members to Camelback Ranch yesterday, including representatives from Sintesis TV, Azteca America, Puro Beisbol, ZETA, El Vigia de Ensenada and Notimex. The group will stay until tomorrow and this is the third year that the club has hosted members of the Mexican media in Glendale. A LITTLE SHIFTY: Today, former Dodger second baseman Steve Sax will be signing copies of his book, SHIFT: Change Your Mindset And You Change Your World outside the Team Store in the Center Field Courtyard from 11:30 a.m.-2:30 p.m.
PAYING RESPECTS: A private memorial service for Hall of Famer Edwin “Duke” Snider will be held on March 12. In lieu of flowers, the family has requested that donations be made to the Fallbrook Union High School Baseball Program c/o Fallbrook Baseball ASB, 2234 S. Stage Coach Lane, Fallbrook, CA 92028.